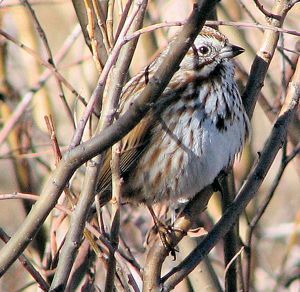 You are likely to be familiar with many of these birds. Some of the smaller birds may not be as familiar. 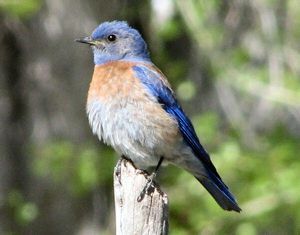 When you are out walking along the river or your own fields or yard, you are probably hearing these birds. If you will spend a little time trying to spot a bird you are only hearing, you will soon know not only what the bird looks like, but its sounds as well. 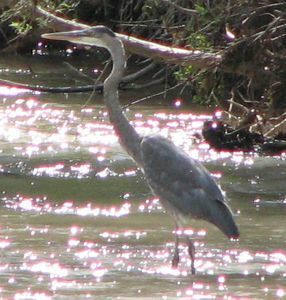 Image Search Only Winter Heron. 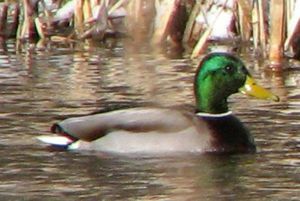 Large, often standing in water. 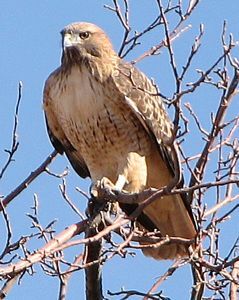 Image Search Often easily identified by visible red tail. From below in flight, the dark front edges of the wings next to the body and the dark "commas" at the wrist are unique among local hawks. 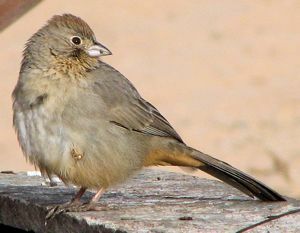 When perched, the dark belly band against the white front is diagnostic. Juveniles (lowest photo) do not yet have a red tail. 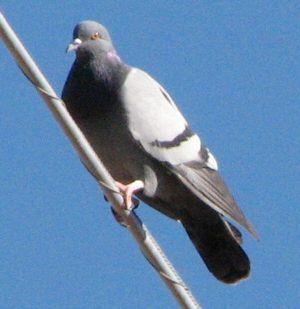 Image Search Common on wires around human habitation, this species comes in a variety of colors. 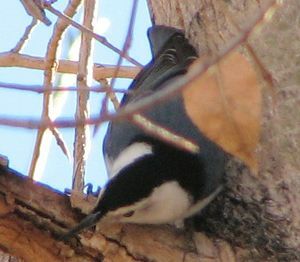 Most individuals show two dark wing bars as shown in the upper photo. 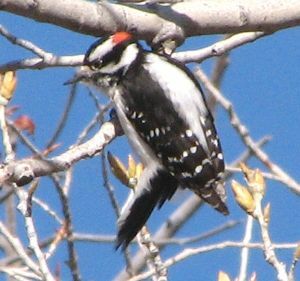 Image Search Almost identical to the Hairy Woodpecker in plumage, this smaller woodpecker is generally distinguished by its diminuitive bill which is much shorter than the bird's head from front to back. 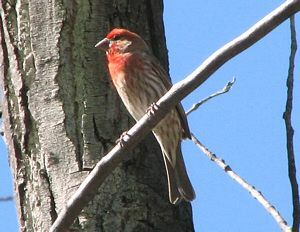 The red patch on the head indicates that this is a male. Image Search One of the most common birds in the valley. 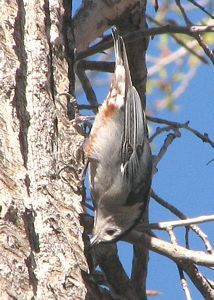 From below, shows red feather shafts in flight. Red feather shafts on underside of wings and tail. Red mark under the eye indicates a male. Female (middle photo): no red face mark. Lower photo shows diagnostic white rump patch which is always visible in flight and sometimes visible when perched. Image Search Common in all area habitats. 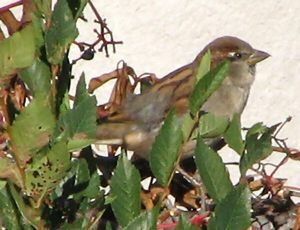 Note white throat and faint white eyebrow. 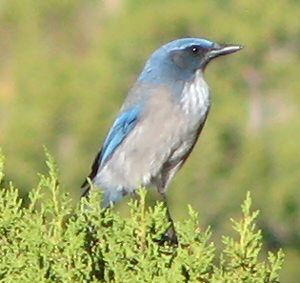 Distinguished from the Pinyon Jay by longer tail and solitary behavior. Image Search Usually observed while calling in flight. 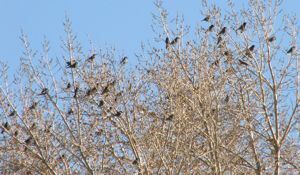 Generally in flocks of 30-70 individuals. 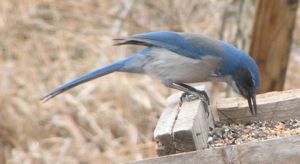 Distinguished from Western Scrub-jay by shorter tail and by flocking behavior. Image Search Unmistakable large black and white bird with very long tail. 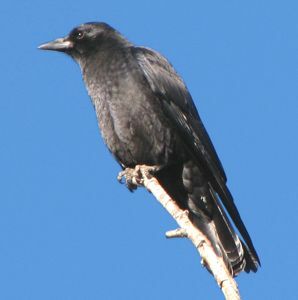 Image Search At times difficult to distinguish from Common Raven as the largest Crows are nearly as big as the smallest Ravens. By sound, the crow's "caw" is familiar. 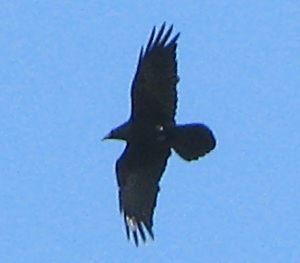 In flight, the crow's tail is often square or rounded. Crows are very social and often appear in noisy groups. Bill smaller and thinner than that of the Raven. Image Search At times difficult to distinguish from American Crow. By sound, a throaty chortle or shout. 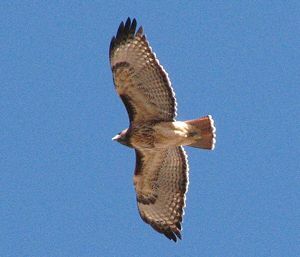 In flight, the tail often appears wedge shaped. 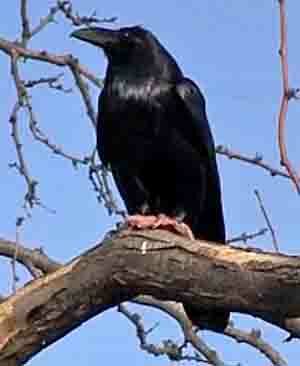 Ravens are often solitary, but sometimes appear with a few other individuals. Often soars like a hawk. Crows do not. Bill is thick and heavy. The throat is shaggy compared to the Crow. 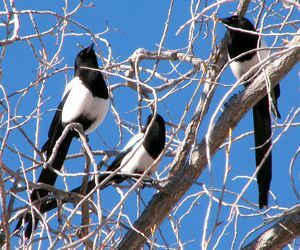 Breeding pairs perform synchronized flight high overhead. 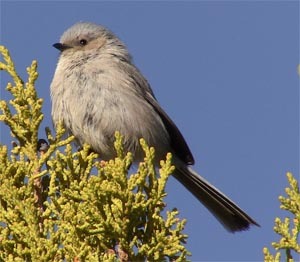 Image Search Tiny (~4in) plain gray bird. Usually travels in groups of 10-20 individuals, constantly moving from bush to bush feeding. 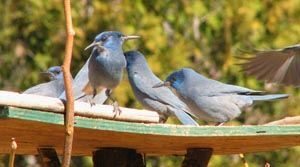 Flocking birds constantly make varied twittering sounds. 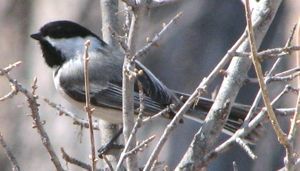 Image Search Distinctive black cap starts above the eye. Only local species that walks down tree trunks upside down. Often heard at a distance: Rapidly repeated nasal "huh". Usually 5-8 sounds, all at same pitch. 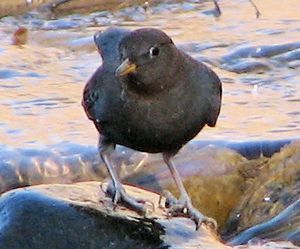 Image Search Slate-colored bird seen in rushing streams. 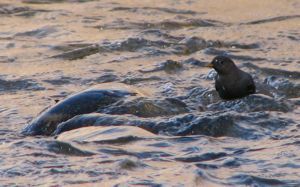 Often standing on rocks right at the water level, bobbing by bending its knees. Feeds by walking on the bottom of the stream. Image Search Male (top photo) has blue head and red breast. During breeding season, colors more intense than shown here. Female (lower photo) has blue in wings, but appears gray from front with a light buffy breast. Image Search Best known American Bird. 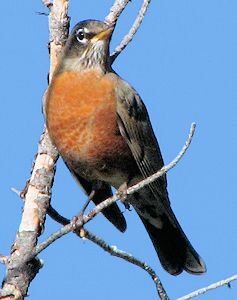 Note reddish breast, light colored bill and large white split eye-ring. Image Search Usually appears black. 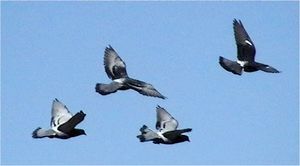 Often seen flying in large flocks. Flocks move very quickly, changing directions often. 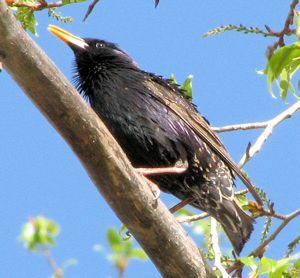 Very short tail is distinctive among "blackbirds". 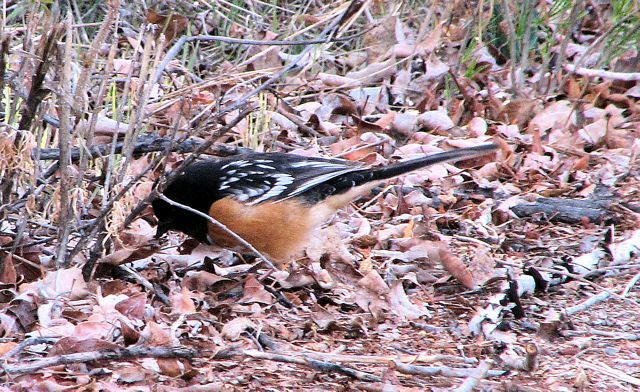 Image Search One is seldom far from a Spotted Towhee. 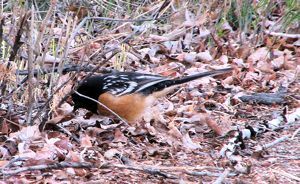 But though they are nearby, they are usually hidden away under trees and shrubs where they toss leaves with their feet looking for insects to eat. 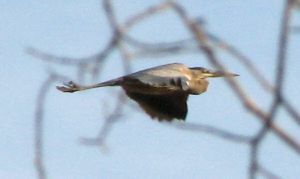 Occasionally you will see one at the edge of the road or briefly flying from one shrub to the next. However, they regularly produce a contact call, a low growl. If you listen for that call and follow it, may be rewarded with a view of this lovely bird with a red eye. 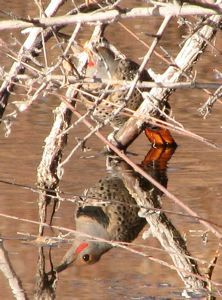 Note white breast with rufous (reddish) flanks. Lower Photo shows bird in its preferred habitat. Image Search Often seen around wood piles and under parked cars. 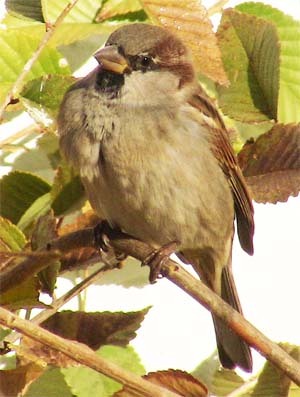 Note the buffy cap on head and buffy feathers under the tail. Dark central spot visible on breast. Image Search This sparrow is rarely seen more than 50 yards from the river and is often right in the willows at the river's edge. Dark back, with streaks on breasts and sides joining a dark central spot. 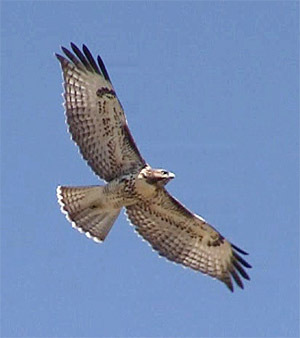 Has a distinctive flight highlighted by a fairly long, rounded tail. 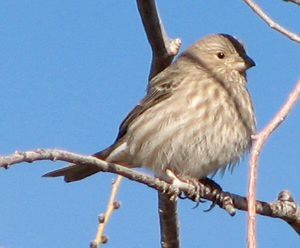 Image Search Often seen at feeders, this species is common in all habitats, especially agricultural areas. 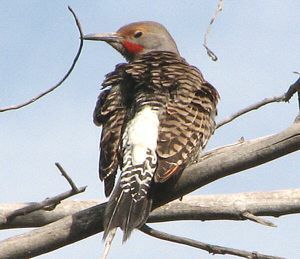 Male (upper picture) is easily identified by red plumage on head, throat, breast and rump. Female (lower photo) does not have red. Both sexes have streaking on breast, belly and flanks. 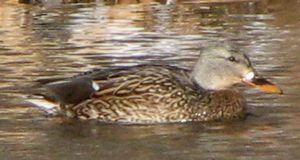 Image Search Common across the continental U.S., this species is generally found around human habitation. 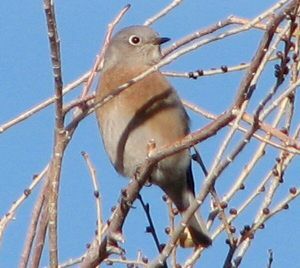 The female (upper picture) is fairly plain with a weak, white eyebrow. 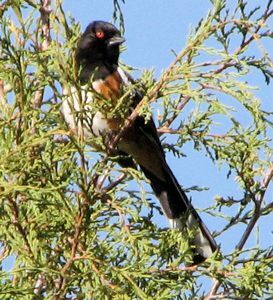 The male (lower picture) has black on the throat, a strong dark mask: often black in front of eye, reddish-brown (rufous) behind the eye. 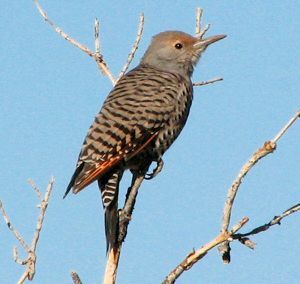 Often in noisy flocks of 5-15 individuals.